Can you resist to the breath-taking glow of fine hand-cut crystal art, reflecting light through their myriad cuts to produce jaw-dropping geometrical patterns on your room walls? Can you think of a better gift to a special friend, other than a peerless shine crystal tea candle holder that will show off your excellent taste, making them remember you forever? Give In To The Luxury Of A Classic DONOUCLS Crystal Candlestick Holder & Let Your Room Shine! Made to make your life a little bit brighter, our original crystal hand cut tealight candle holder is coming to underline your home or office classy personality! Modern yet classic thanks to their timeless geometrical patterns, these exquisite crystal handicrafts are intended for adding peerless sparkle to any room, making the focal point of your home or workplace environment. Plunge in relaxation with a flickering candlelight luxuriously hosted in a clear crystal tealight holder beautifully placed on your living-room shelf or on your desktop and feel creative with the inspiration of an all-time-classic piece of crystal artwork! Let it make the candle centrepiece on your next dinner party, impress your guests and underline your excellent taste with this timeless decorative candle holder! Make a special person in your life remember you forever with a piece of radiant crystal artwork! Impressively luxurious, with excellent manufacture and exquisite packaging, DONOUCLS tea candle holder will underline your elegant taste! NO QUESTIONS 100% REFUND GUARANTEE,Click Add To Cart NOW While Supplies Last! BREATHE NEW LIFE INTO YOUR HOME DECORATION : Decorate your dining-room, living-room, bedroom, office or kitchen with premium hand cut crystal candle holder,that will make your guests's heads turn! FEAST YOUR EYES ON CRYSTAL ARTWORK : Elevate your home's style with a unique crystal candlestick holder! Make your dining table or office desktop shine with a flickering candle in a Crystal Tealight Candle Holder! FINEST QUALITY MANUFACTURE : Hand cut from highest purity optical non-lead glass to ensure top durability and easy, safe cleaning, Donoucls candle centrepiece will create a classy, inspiring, relaxing atmosphere. AN EXCELLENT GIFT : Crystal artwork in deluxe packing is the perfect gift to somebody special! 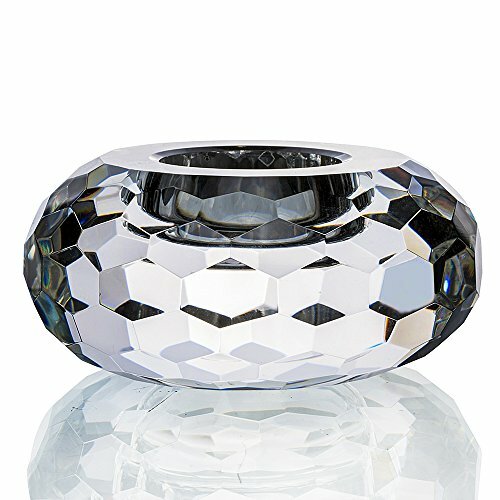 Offer this crystal candle holder on Valentine's Day, Thanksgiving, Christmas, on a wedding or a housewarming party. If you have any questions about this product by DONOUCLS, contact us by completing and submitting the form below. If you are looking for a specif part number, please include it with your message.